The photographer that viciously smeared John McCain at her website might be facing a lawsuit for violating the terms of agreement in her contract with The Atlantic magazine. 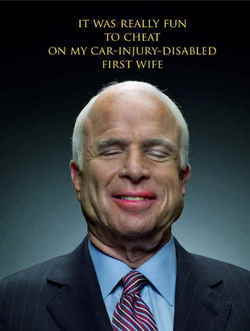 As NewsBusters reported Saturday, Jill Greenberg not only admitted to taking a rather sinister picture of the Republican presidential candidate that she hoped The Atlantic would use on its October cover, but she also generated some truly disturbing and disgraceful images of McCain which she proudly displayed at her website. MEGYN KELLY, HOST: What do you do to shut down her use on her website, not just of that covershot, but the disgusting things she has done to John McCain's image on her website which I won't repeat here? BENNET: She's violated the terms of our agreement with her, or our contract with her. So, we're taking steps. We're looking into steps we can see to do something about that. KELLY: Are you considering a lawsuit? BENNET: We're looking into what we can do. KELLY: Would that be including legal action? BENNET: If we can, if it's available to us, yeah. KELLY: Has she been paid? Clearly, this story isn't over yet...not by a longshot.